I’m not usually a big fan of Secret Santa arrangements. In fact, I recently went on a long diatribe about the evil of Secret Santa with my wife (who thinks I’m a Grinch). But when I’d heard about what Reverse Thieves does each year, I immediately jumped on it. I was terribly excited, until I saw my recommendations – there was not one anime I had an interest in among my picks! First, there was Tsukuyomi Moon Phase – a show I had flirted with watching at one time, but really wasn’t too keen on watching. A second choice, Kino’s Journey, looked dull to me. So, I settled on a unique-looking series called Kaiba. It was a little too unique for me. I stopped halfway through the first episode. And lucky for me that I did, because the choice I settled on has ended up becoming a new favorite. 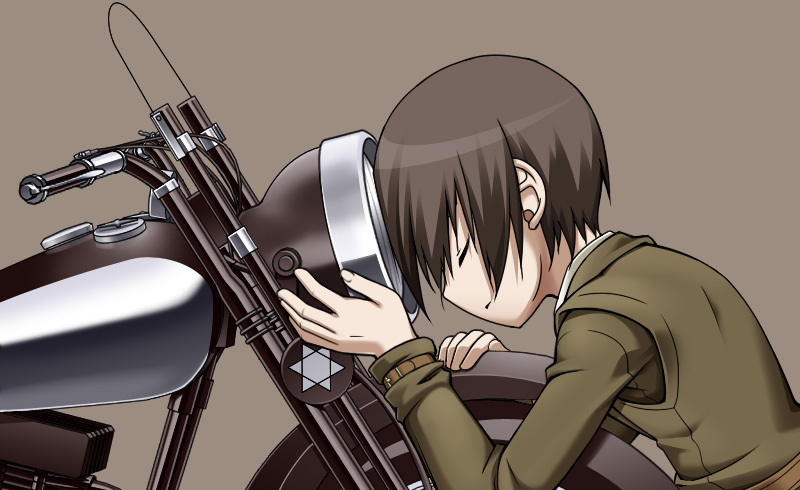 Although it took a few episodes, Kino’s Journey got it’s hooks in me and hasn’t let go. Like I said, though, it took a bit of convincing. Prede linked me to an interesting note he wrote about the show on his MAL account, which encouraged me to watch. But even when I started, I found the animation unattractive and the show too slow for my (typical) tastes. Perhaps most distracting were the voices, as I saw it with dubs the first several episodes. While I enjoyed Kelli Cousins’ mature voicing of the lead, Cynthia Martinez’s Hermes sounded so much like Pucchan from Best Student Council that I had a hard time taking the show seriously. But I kept watching, at least not to let my Secret Santa down. 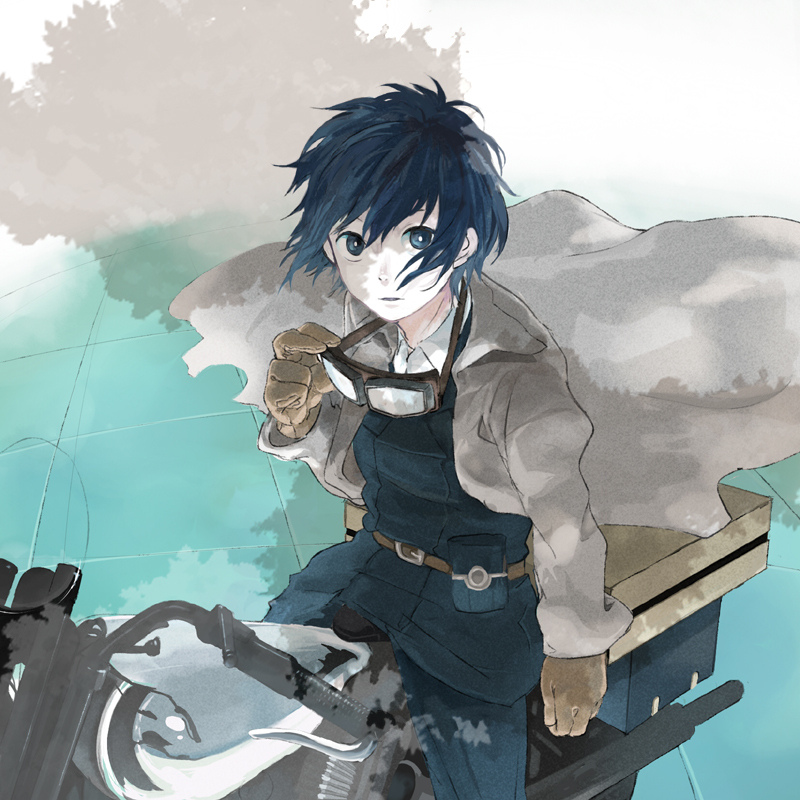 Mostly episodic in format, the show follows a girl (sexually ambiguous at first) named Kino and her talking motorcycle, Hermes, as she journeys through her world, spending three days at each country she visits. Most episodes play like fables that reveal the human condition. Combining the fantastic, mundane, and anachronistic with creative stories, settings, and twists, the series is gripping. From a person who views characters and character development as the most important thing, it’s saying something I enjoyed the show so much despite the series only having two major characters who change little (or not at all) in the course of the series. I also enjoyed the voices of Ai Maeda (Kino) and Ryuji Aigase (Hermes) when I finally started watching the sub. By the way, Kino is undeniably likable. As Poo-Chii says, it’s impossible to hate her. Strangely enough, Kino reminds me of Spike Spiegel from Cowboy Bebop. Both are cool and capable, and rarely let their truest emotions show. Each also has an interesting background that dramatically informs how they live their lives. And although very different in tone, both shows are episodic in nature. But back to the show at hand. At first glance, Kino’s Journey seems to reveal all that is bad in human nature: selfishness (episode 2), fear (ep. 1), hedonism (ep. 6), vengeance (ep. 7), and bloodlust (ep. 12). At times because of our nature, life is full of sorrows, expressed through emotional distance (ep. 1) and death (ep. 13). But there’s light at the end of the tunnel. Despite the dearth of morally strong characters in the series, there are a few the audience can admire. And in a depressing land, they stand out, like Nimya, the girl who wanted to fly, and Sakura, who reminds Kino of herself. Really, Kino’s fantasy lands are very similar to our own. The depravity of mankind is alive and apparent in our world as well. Yet, there’s beauty to be found – and not just in nature. As Kino tells Hermes, the beauty of humanity is similar to the beauty of the world. And there’s also beauty in life – Kino shows this by how she values life, both of humans and of animals. Perhaps she learned this best of all at the beginning of her journey, which Kino is able to start because of one man’s sacrifice. It’s this sacrifice, by the original Kino, that best demonstrates a connection to Christian spirituality. One man takes the punishment and dies for the “sins” of a girl in a world gone awry with sin. Because of his sacrifice, the new Kino is able to live a new life. She is given a new heart, using New Testament terminology. But the man doesn’t leave her to an adventure by herself – Jesus said that He would leave the Holy Spirit with us, and the first Kino does the same, leaving Hermes to help Kino on her journey. Because of the Christ figure’s sacrifice, she doesn’t have to to live the half-life she was destined for – Kino can live a whole one, experiencing the wonders of life anew. Luckily, I was able to journey along with Kino. Thanks, Secret Santa, for a wonderful gift this Christmas. That’s written much better than mine. I’m still not 100% what to think of the series. I enjoyed it but I also didn’t love it. I’m thinking that its a series that needs to slowly sink for me. Like Hisui said, it not really the best series to marathon, which is how I saw it. I had a hard time putting into words what I thought. You did an excellent job. Yeah, Kino is best seen an episode at a time (if you have the time), for you to think about the meanings of the stories told. As mentioned in the post, it’s a great look at the human condition, and definitely one that makes you think for you to really enjoy it. Oh gosh, if I marathoned the show, I don’t think I would’ve liked it much. In fact, I probably would’ve quit. It grows on you over time. I surprised myself by the fact that I was anticipating the final episodes, even without a real story to resolve. I hadn’t heard of the Reverse Thieves Secret Santa until you posted it! Next year, remind me early please? I’m glad you took a chance on this. This is one of my favorite shows, I really love it. Nice review, too! I love how each episode portrays different parts of humanity. Thanks! It’s such a terrific series – so much depth to it. Haha, perhaps Chrono Crusade next year? Hehe. Through this series of posts, I’ve discovered just how many dozens and dozens of Christmas episodes are out there. I myself really admired what Kaiba was doing but it is really a hard series to get through so I understand you checking out when you did. I never finished it myself but I plan to try again another day. But as you said maybe it was just in the stars for you to go with Kino. 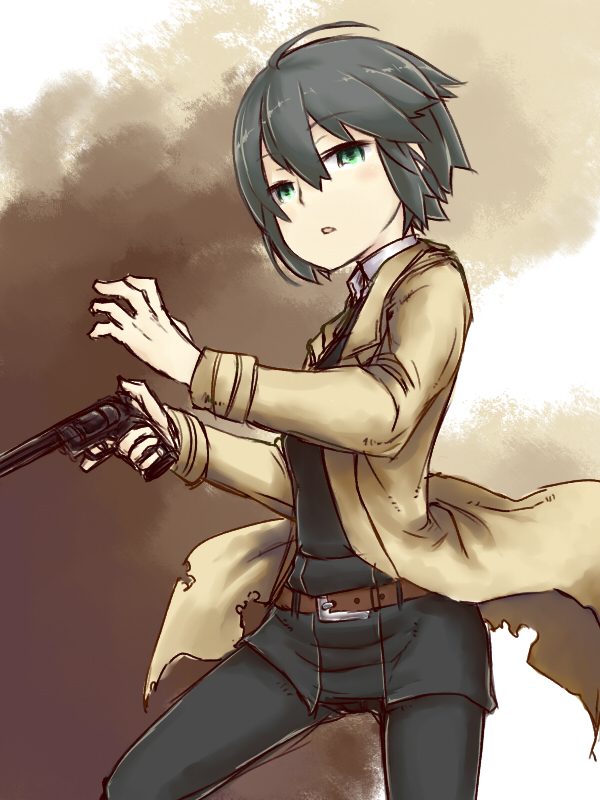 As the Big N said Kino’s Journey is best watched one episode at a time. Many of the episodes just need to sit with your for a bit otherwise it gets easy to get your wires crossed with the series. Kino is so very interesting becuase on the surface she seems extremely unemotional but as we go on we see there is more to her than merely the stoic wanderer. You perfectly pointed out how when we examine Kino we see her compassion and humanity despite the fact that she plays her cards close to her chest. I am glad you enjoyed something a bit off the beaten path and found something you really loved. I hope that you can participate again next year! Kino definitely needs to be watched over time. I think it takes time to let the juices stew – to let each episode seep in. And it can often be depressing, although that’s not what we’re supposed to take from it. Kino is an amazing character – you gotta work (and keep watching) to see the true Kino, but when you do, she becomes all the more wonderful. I’m very glad that you enjoyed this. This show is so profound, so intelligent, and so different from other shows it deserves a look. I was blown away by the many things this show has to say about our world. It’s like a bunch of parables, but it’s not condensing at all. It’s so simple to grasp what the show has to say, at yet it’s still extremely smart about everything. Kino is a great character too! She has such a different view on the world as the rest of us. This is a series I would never review, as I find it difficult if not impossible to put to words exactly what this series is about, why and how it does what it does, etc. But you did it amazingly well. Great review man! Thanks for mentioning me! BTW I liked the simple look to the show, it has a “storybook” thing going on with the artwork, that is really fitting. Oh yeah, I’m very glad I watched this series. You’re right – it’s not condescending, nor does it preach at the audience. And it’s both simple and profound. At the end of most episodes, I would think about how carefully crafted the show was. You’re right – the simple look fits the show well. It definitely feels like you’re “reading” a fairy-tale/fable-like story. And by the end of the series, I was really enjoying the character designs. 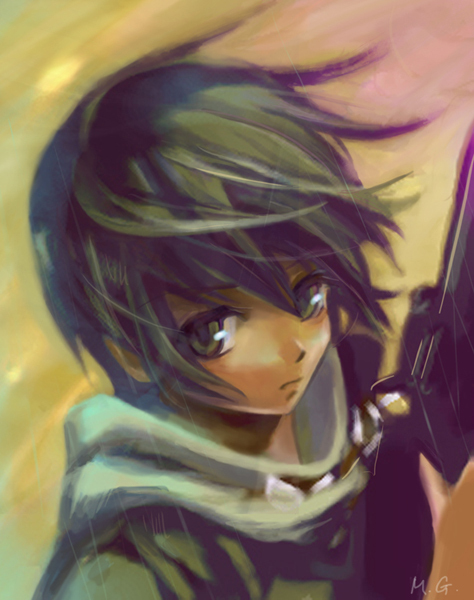 Kino, in particular, is designed well, with a simple and waifish look. One of my fantasies has always been an episode of Kino where she and Hermes come to a country surrounded by a tall wall, inside of which live winged, be-haloed people known as “Haibane”. Bwahahahaha. Those series do have very similar tones, emotionally and in the colors they use. “Five or six episodes”? You got through the introductory material (which could only sustain attention through curiousity about the world of the Haibane, I imagine), and quit just as it was about to get good. Not that you’d have been able to tell that was about to happen. It might be worth picking it up again where you left off. The last half of Haibane Renmei is pure gold. Oh, and it might provide lots of food for blog-posts — the last half of Haibane Renmei centers on the notions of sin and despair in interesting ways. Oy…this is what I was afraid would happen. It would get good just when I quit. I got the feeling that the slow, nothing-much-happening feel of the series was what the whole thing was about. If there’s major plot development (particularly regarding those themes), I’m sure I’ll return to it. In fact…I think it’ll be first on my “to watch” list. Add my voice to dm00’s recommendation – finish it. From where you left off, the best is yet to come. These comments now have me itching to polish up that unpublished draft and inflict it on the blogosphere – but alas, I can’t locate the blasted file. Part of the fun would be to rewrite it, no? Hehe. Anyway, I would be really interested to read the post, after I finish the series. Nice review. If you liked this show, I highly recommend that you check out Mushishi (if you haven’t already). Such a wonderful show! As time has passed, my appreciation for it has increased. Thanks for the rec! I did try Mushishi once and dropped it (probably too soon, as I am prone to do). These slower-paced, thoughtful series are usually not up my alley (does that say something about me? hehe), which makes my enjoyment of Kino’s Journey stand out all the more. Impossible to hate Kino? Well there’s somehthing wrong with me then, because I hate her. She’s too cold and emotionless for me to care about her. I like the anime, but Kino pisses me off, really.